God doesn’t saunter in once for all and settle like a large cat plumping herself into your favorite rocker with an air that says, “Here I am! Now your life is complete!” God dances beyond the threshold and must continually be enticed into our dwelling. I hope these essays remind us all to extend that invitation, clean all the corners and polish the windows, throw wide the door. 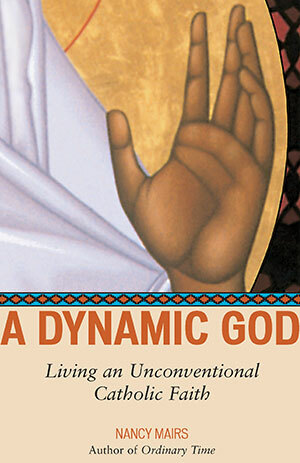 In A Dynamic God, Mairs returns to the subject of religion and spirituality and gives us a passionately individual book of meditations on a life of engaged faith. Raised Congregationalist in New England, Mairs is a convert to Catholicism. She is also liberal, feminist, and outspokenly activist-and all that in an increasingly conservative church that scorns her brand of progressive iconoclasm. A Dynamic God explores through beautifully written personal essays the question of why and how Mairs became and remains a Catholic (“despite all odds“); what she finds to love in that tradition; and more broadly, as she writes, how she experiences the holy in her life and in the world. Mairs gives a wonderful picture of the community of worship she belongs to in Arizona, the Community of Christ of the Desert. They celebrate mass in each others’ homes, and Mairs writes about the energy that flows from “the intimacy of crowding together, the creativity of our liturgy, the surprise and humor that bubble up in our dialogue.” In the Latino image of the Virgin of Guadalupe she finds inspiration for a commitment to social justice, which she writes about in an essay called “Coveting the Saints.” There are essays here on sin and abundance; on understanding vocation in a life circumscribed by multiple sclerosis; on enacting a life of faith through activism.